I was making dinner for Daniel and I when I decided to fold our napkins into roses. 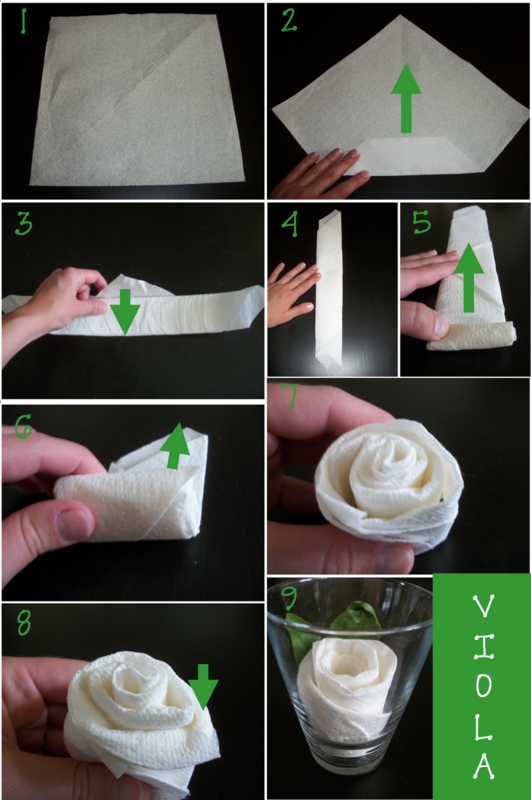 Napkin folding can be super complicated, but it can also be super easy. This rose is definitely an easy one. You'll find a photo tutorial below. I garnished our rose napkins with fresh basil from the garden. Below is an additional picture of our rose napkins in action! By the way, I steamed our entire meal in Daniel's rice cooker. Get out! I did! And now I only have one dish to wash (well that's not entirely true, but you get the idea). Happy cooking and happy crafting! Again, don't forget about my GIVEAWAY! I make cards and I wear a lot of cardigans. It's as simple as that. I'm a twenty-something year-old middle school science teacher who loves just about anything and everything crafty and outdoorsy. I get to indulge the crafty side of me with cards, cakes, and anything else I can get my hands on. I then satisfy the outdoorsy side by backpacking, cycling, hiking, kayaking, scuba diving, and skiing with my handsome husband. Of course, I can't go without mentioning my love of languages and my dream of traveling. I have a laundry list of languages to learn and a map of the world to cover.